Another week, another read-a-thon, and this time we have the BookTubeAThon which can be found over here explained by Ariel, along with information on the hosts and the challenges if you so choose to accept them. After watching Cat's video I've decided it could be a lot of fun to follow along with the challenges, so here follows my choices for the categories and what I'll be reading over the week 3rd-9th August, midnight to midnight. 1. Read a book with blue on the cover - Slaughterhouse-Five by Kurt Vonnegut, a relatively short read and one I've been meaning to read for the past few years/forever. 2 . Read a book by an author who shares the same first letter of your last name - The Boy Detective Fails by Joe Meno, which has been hanging around on my shelf for about three years and I can't actually remember why I bought it. 3. Read someone else's favourite book - Extremely Loud and Incredibly Close by Jonathan Safran Foer, which is a bit of a cheat because I didn't actually ask anyone what their favourite book was and just copied Cat's choice from the video seeing as I already own a copy. I've heard a lot of very mixed things about this so I'm interested in forming my own opinion on it next week. 4. Read the last book you acquired - The Wind in the Willows by Kenneth Grahame, thankfully a short, easy book seeing as I've been putting off buying any massive tomes recently. 5. Finish a book without letting go of it - Civil War: Captain America by Brubaker, Perkins, and Weeks, another companion to the main Civil War comic book storyline that I have sitting on my shelf in need of a reread. 6. Read a book you really want to read - The Sin Eater's Daughter by Melinda Salisbury, which looks like a quick read, and I fancy a bit of fantasy YA at the moment. 7. Read seven books - I will be finishing off with The Diary of a Nose by Jean-Claude Ellena, inspired by my recent post on beautiful books. I'm eager to be transported to a Parisian parfumerie this summer. Please link me to any of your current TBRs or let me know if you're planning on taking part in the BookTubeAThon too! It's running from August 3rd-9th and should be a lot of fun. 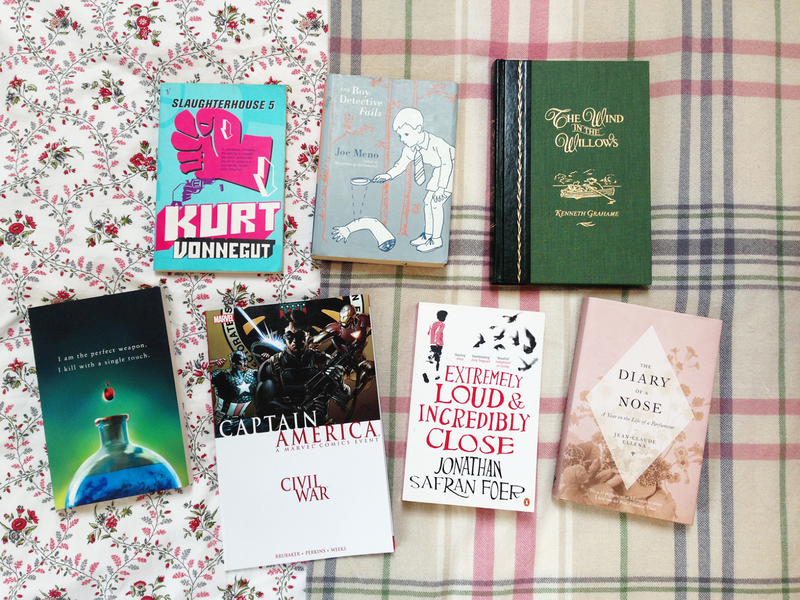 I really like these challenges because they seem to have given me a really mixed bag of things to read, from children's classics to YA fantasy, graphic novels to memoirs. P.S. If you haven't already filled in my blog reader survey, you can do so here!